Sit back, close your eyes and watch your imagination run free! Many of the best ideas and inspirations come from daydreams. This CD is designed to help you tap into this amazing resource. The CD begins with relaxing music, designed to calm your mind and relax your body. Then listen as soft music and brainwave tones combine to generate the special frequencies associated with daydreaming and meditation. As your brainwaves synchronize, you will find yourself entering a relaxed, creative state. Without any conscious effort from you, your mind will wander into new and unexplored areas, helping you solve problems and generate fresh ideas. 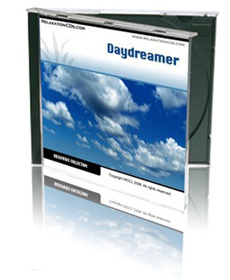 Any time in future you need to harness the power of daydreams, this CD will always be here to help you. And if anyone asks you how you keep coming up with all these great ideas and insights, the best news is, you don’t ever have to tell them!